Sushi Sandwiches. Yes they are a thing. Yes they are amazing and delicious and sooo much easier for sushi noobs like myself who can never, I mean never make a sushi roll successfully without the entire thing splitting and getting sticky rice everywhere. 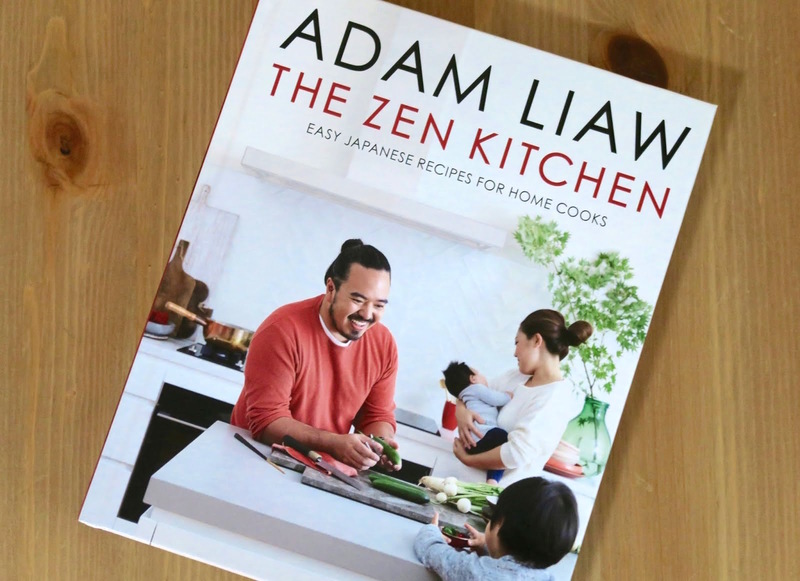 These miracle little sushi bundles, actually called onigirazu in Japan are from Adam Liaw's new cookbook 'The Zen Kitchen' which is full of Japanese recipes you can make in your own kitchen. The recipes are a great mix of easy and simple but also don't lack the Japanese food we all know and love from our local restaurants. I've never been to Japan so can only judge on what I know from here and some recipes I recognise, some I don't and others I cannot wait to try! Theres are a few odd ingredients here and there that you can't get in the generic supermarkets but would be easy to find in any asian grocery store. A little planning before you spontaneously crave Japanese food to stock your store cupboard and you'll be set for any mid-week Japanese craving you may have. Since the only take-out that delivers to us is pizza, Thai and Indian. I'm stocking up this weekend to get some miso paste, bonito flakes, sake and mirin. As soon as I finished clearing up our ikea dining table that I'd turned into a little sushi sandwich making bar I sat and wrote this. I needed to share. 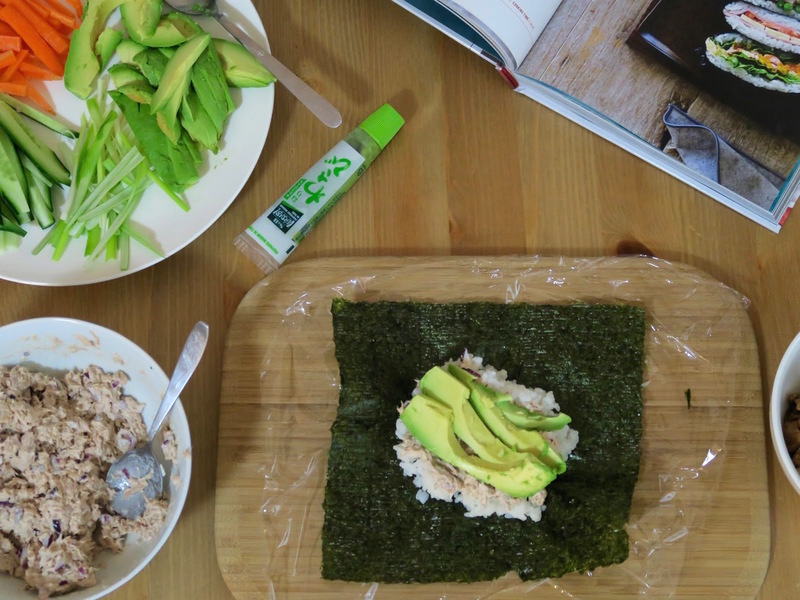 I need others to know how great homemade sushi is with little technique, you won't feel like a total failure when making it and I can assure you the amount of sticky rice in your hair at the end is reduces dramatically. I attempted standing on one of the chairs to get some sort of photo series to actually show you how easy this is, and get some shots from above (not on a blue bench) but I was firmly spoken to by 'hanger' to sit down and stop taking photo's so we could eat. And boy was it good. We wolfed them down and I didn't get sticky rice on my elbows (or hair!) this time making sushi at home. Here's the thing, I actually can't believe someone didn't tell me about this earlier or I didn't figure it out. I mean I've made myself thousands of sandwiches before... it just seems logical now you think about it. Or is this some secret Japanese secret that Adam Liaw just told the whole of Australia/the world?! 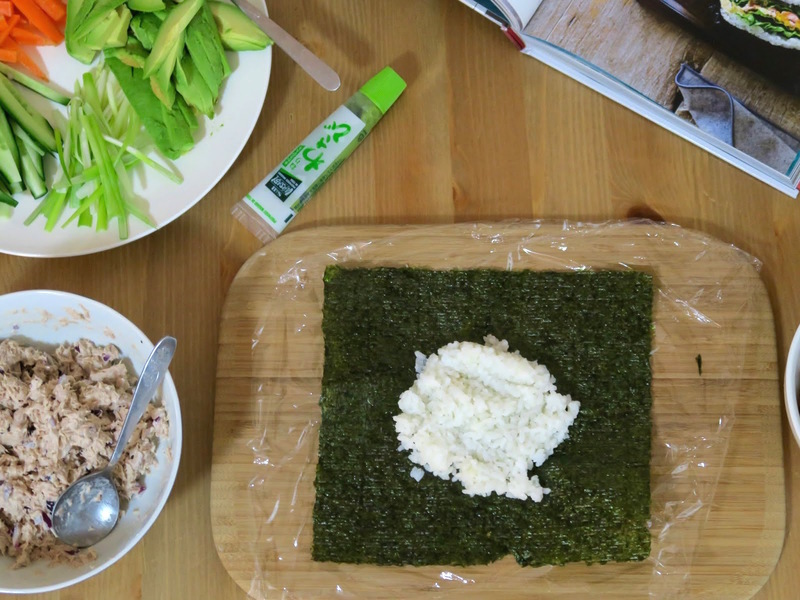 If it was, thankyouthankyouthankyou and I'm sorry if your grandmother scalded you for sharing it but again, thankyou for this genius way of making sushi at home. Next on the list to make is the agedashi tofu - my favourite! 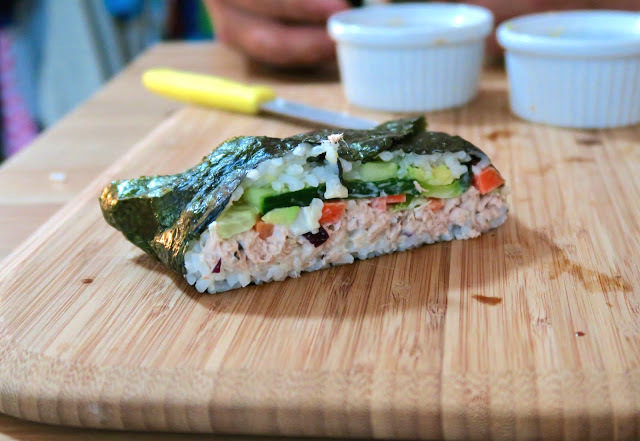 - Place a sheet of nori on a piece of plastic wrap on a cutting board with the shiny side facing down. 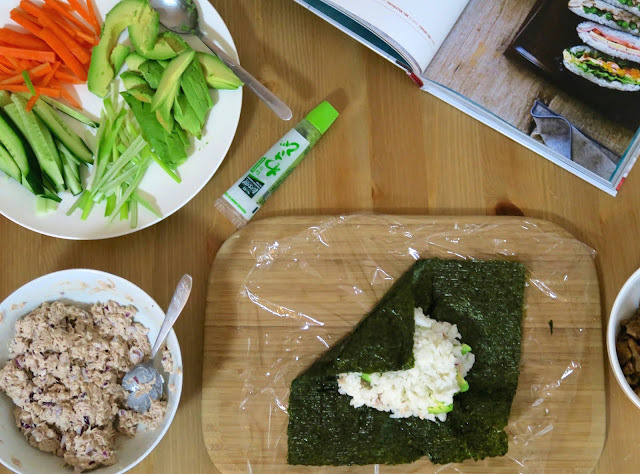 Spread 1/2 cup rice in a 10cm square at a 45 degree angle to the nori. Top the rice square with your choice of filling and cover with the remaining 1/2 cup rice. 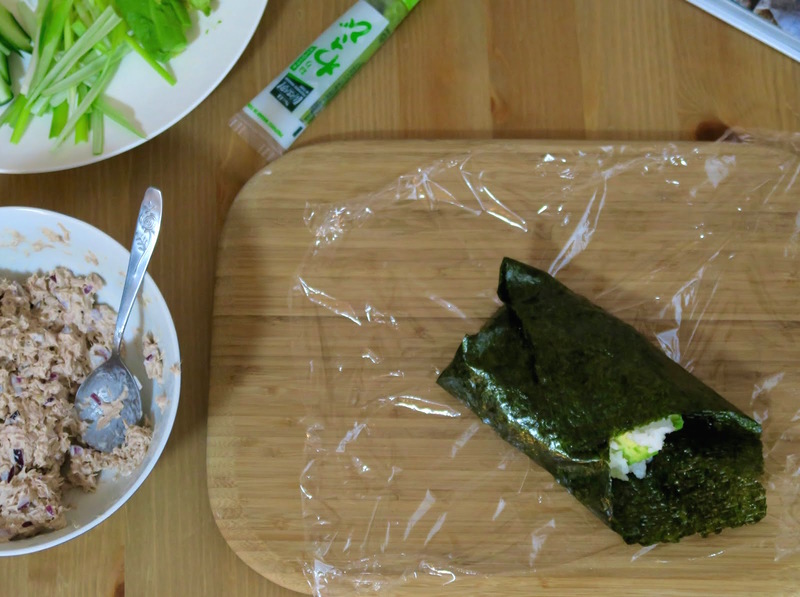 - Fold the corners of the nori sheet into the centre to create a square with the filling inside. Gather the plastic wrap around the sandwich and leave wrapped for at least 10 minutes for the seaweed to soften and stick to the rice if you can wait that long... I couldn't. - Use a sharp knife moistened with a little cold water to slice through the centre of the sandwich to reveal the filling, and serve. - Rinse the rice thoroughly and cook according to the packet instructions/rice cooker/this link. 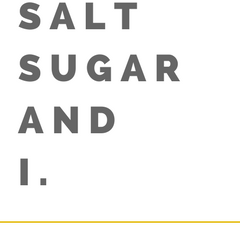 - Place vinegar, caster sugar and salt in a saucepan and stir over low heat until all the sugar and salt is dissolved. Allow to cool to room temperature. - Transfer rice to a large bowl to cool slightly and gradually sprinkle over the vinegar mixture a little at a time stirring the rice using a spatular. Give it a little taste and see if you need to add more if unsure. 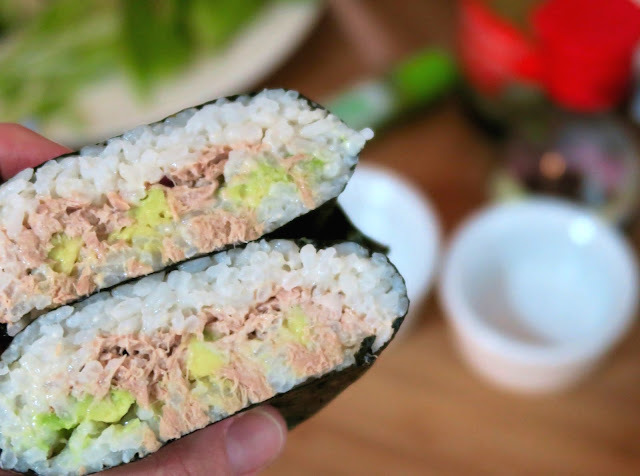 This is not only great in these sushi sandwiches but is probably one of my favourite regular sandwich fillings too. My mum used to make this for me as a kid and to stop my sandwich going soggy she'd put it in a little container to add to at school. This will also keep for 2 days in the refrigerator in a sealed container. - Mix all ingredients together in a bowl. Taste to see if you need more or anything listed above. - Place in between your favourite bread or in a sushi sandwich.